Sonny’s Racing Engines builds massive 932-ci fuel-injected Pro Stock drag racing engines delivering 2,050 hp at 8,100 rpm and that’s no accident. They are equipped with highly refined induction systems that pinpoint the exact airflow requirements of the engine’s operating range while providing nearly 1,450 ft-lbs of torque at 6,700 rpm. 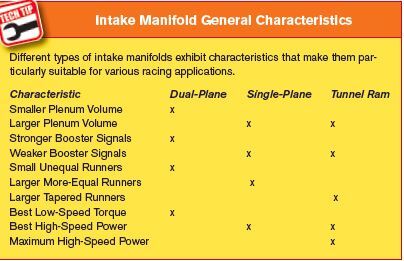 Race applications deal with three basic manifold types: dual-plane intakes, single-plane intakes, and tunnel ram intakes (effectively a taller single-plane intake). Indi­vidual runner (IR) intakes are also employed in some applications, but not to the extent of more common plenum-style intakes. Each type has its strengths and weaknesses and tun­ing characteristics that make it suit­able for particular high-performance or racing applications. Accordingly, manifold characteristics and dimen­sions exert considerable influence on engine performance with respect to power band shape and positioning on the RPM scale. Most applications employ com­mercially available intakes designed for broad application coverage while high-end applications lean more toward custom-fabricated manifolds that are built with spe­cific dimensions applicable to their exact competition environment. This article examines each of them separately and identifies char­acteristics of each type that make it most suitable for a given racing application. Dual-plane intakes effectively divide a V-8 engine into two inde­pendent four-cylinder engines con­nected by a common crankshaft. The design divides intake runners into two separate groups, each exposed to alternating induction pulses, or airflow requests submitted by an opening intake valve and the accom­panying pressure differential in a given cylinder. When a manifold is divided into separate cylinder groupings with alternating and evenly spaced pulses it is said to have 2 degrees of freedom. This configuration produces stronger pressure waves, effectively emulat­ing longer runners that tune to lower engine speeds. Dual-plane intakes are highly effective as high-performance street manifolds because they pro­mote strong torque at street engine speeds. Similarly they are ideal for many sportsman racing classes that depend on low- and mid-range torque for optimum performance, particularly with heavier cars in vari­ous circle track applications. Viewed from above the dual-plane’s plenum shows the high-side floor (left) wetter and darker from fuel separation. Note gentle radius entering the runner. As the fuel charge decelerates coming out of the carburetor it makes the turn into the lower runners more easily and with less fuel dropout. 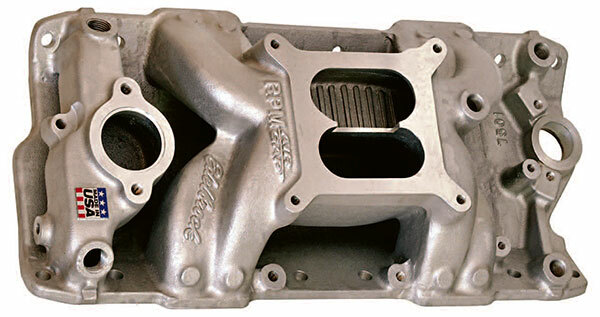 Dual-plane intake manifolds are a core component of many sportsman racing classes. They are widely recognized for their superior low- and mid-range torque. Isolated dual plenums differ in volume and booster signal strength. The larger volume of the deep-side plenum encourages an easier turn into the runners with less fuel dropout. The smaller high-side plenum can experience fuel separation due to high-charge velocity exiting the carburetor, close proximity to the plenum floor, and immediate turn into the runners. 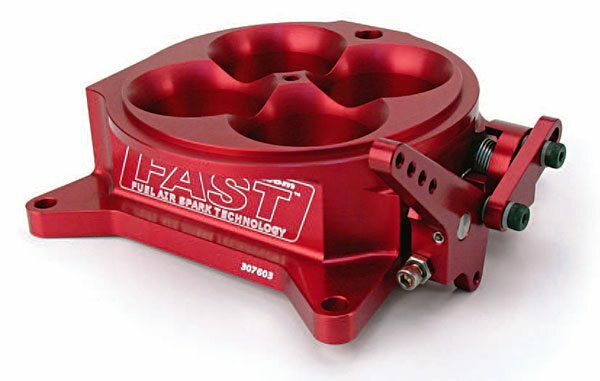 Dual-plane intakes submit strong booster signals to the carburetor, promoting crisp throttle response and increased runner energy for effective cylinder filling at lower engine speeds. In effect, each cylin­der only sees half of the carburetor or, in a sense, a 2-barrel carburetor with a single primary bore and a single secondary bore, each requiring individual tuning according to ple­num size, configuration, and engine speed. Competition dual-planes are typically effective in the 2,500- to 6,500-rpm range. Their runners are dimensionally tuned to promote a torque peak between 4,000 and 5,500 rpm depending primarily on runner cross section and engine dis­placement. 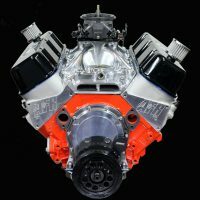 If dual-plane intakes are required for various racing series, it is impor­tant to consider their unique charac­teristics and how they might best be manipulated to optimize power and performance in the most effective operating range. Well-designed intake runners have a fixed cross-sectional area that you can use to calculate the RPM where the torque peak occurs. Once you identify the RPM where the intake builds maximum torque, you can manipulate supporting torque components to help boost torque above or below that point depend­ing on how the car needs to perform. This broadens the overall torque curve and is the same procedure you can use to successfully pinpoint and position torque with single-plane and tunnel ram intakes. To accom­plish this the cross-sectional area of the individual intake runners must be known. To calculate the cross section of a given runner, measure the dimen­sions of the runner entry and the runner exit, then average the two. This yields the mean cross-sectional area of the runner, which can then be used to calculate the mathemati­cally defined torque peak using the well-known McFarland formula. Calculating the cross section by averaging runner entry and exit dimensions incorporates any degree of taper that may be present in the runners. Runner taper provides additional flow volume while pre­serving port energy by promoting a venturi effect with decreasing run­ner cross section along the length of the flow path. 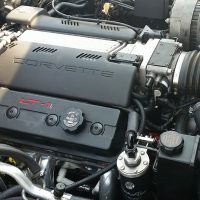 Depending on the engine type, a dual-plane intake likely has unequal-length runners on the center cylinders as compared to the end cyl­inders. The longer runners tend to boost torque below the torque peak and the shorter runners promote torque above the peak. The peak loca­tion on the RPM scale is governed by the mean runner cross section. This effect can be strength­ened by providing complementary primary tube dimensions on the exhaust headers. Longer intake run­ners should be paired with longer primary tubes and shorter runners should be matched with shorter pri­mary tubes to broaden the overall torque curve. Think of these efforts as torque shifting to bias torque one way or the other around the torque peak. You also have the option of employing larger or smaller pri­mary tube cross sections on selected cylinders that are torque deficient due to a weak flow path, i.e., good port/bad port as found in big-block Chevys. This promotes a secondary torque peak that broadens the over­all curve. 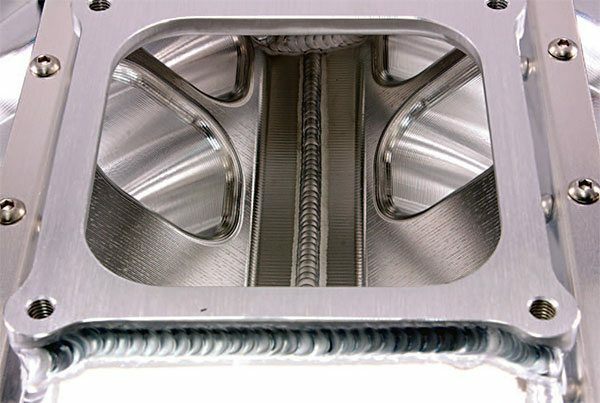 An open spacer on a dual-plane intake increases plenum volume and exposes both sides of the plenum to inconsistent pressure changes. A four-hole spacer adds volume but maintains the separation between left and right plenums. Both can help ease the turn into the runner on the high-side plenum. Results vary depending on cam timing, carb size, and engine speed, hence careful testing is required. 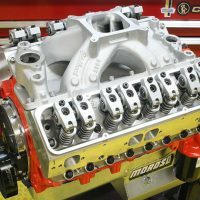 From a different tuning perspec­tive, carburetor spacers and tuning adjustment may also improve the overall performance of the dual-plane intake manifold. As previously noted, dual-planes generate stronger pressure pulses and carburetor sig­nals due to the separation of the ple­num area into two smaller volumes. In many cases it can also be benefi­cial to investigate a different method of stagger jetting based on the high side as compared the low side of the divided plenum. The high side gen­erates a stronger booster signal than the low side so it tends to dominate jetting selection for the engine. It’s entirely possible that the deep side (generating a weaker signal because the booster is farther from the signal source and the plenum volume is greater) tends to deliver a leaner mix­ture because the weaker signal does not pull fuel through the jet as easily. It may be beneficial to run slightly more jet on the deep side of the plenum. The amount of side-to-side jet stagger varies with plenum depth and volume, runner cross sec­tion, and engine speed. Dyno test­ing can establish the ideal difference between left-side (deep) and right-side (high) jetting based on power readings, EGT levels, and oxygen sensor readings if you have them. Once you establish the optimum spread, you can adjust accordingly at the track. Automatically going richer on the deep side may not always be the best choice as that side may already be rich so it’s best to take jet out of the high side until power falls off. Once you establish that point, you can tune the low side according to the best spread as indicated by the dyno or actual track performance. As a rule, the low side often requires at least one jet size larger once you have optimized the high side. This varies depending on the height and type of carb spacer and whether or not the spacer permits cross-talk or pulse transfer between the divided plenums. Depending on the type of spacer you elect to run, you may compound the problem and require more jet stagger to equalize fuel delivery. Remember, different-length runners resonate at different engine speeds, thus encouraging separate torque peaks and affecting the fueling requirement accordingly. A spacer’s chief value is not in adding plenum volume per se, but rather in easing the ability of the high-speed air/ fuel charge to make the sharp turn into the runners without depositing most of the suspended fuel against the plenum floor. With a dual-plane there is no practical way to equalize the distance from the signal source to the boosters on all four barrels of the carburetor. Fuel droplets may hit the ple­num floor and fall out of suspen­sion on the high side because there is less room to make the turn into the runner. That means the low side of the manifold may generate better mixture quality than the high side. Juggling air bleeds might provide some relief, but they are generally too sensitive so stagger jetting is usu­ally a more valid tuning strategy in the absence of a spacer design that would be open on the high side while incorporating throttle bore extensions to enhance booster signal on the deep side. There are performance gains to be harvested for those will­ing to investigate booster signal and jetting requirements on separate sides of dual-plane intakes. Single-plane 4-barrel intakes are a staple of contemporary sportsman drag racing. 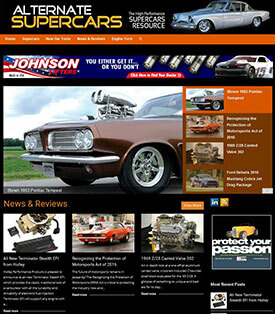 They are inexpensive and provide superior power and performance in a high-RPM drag racing environment. 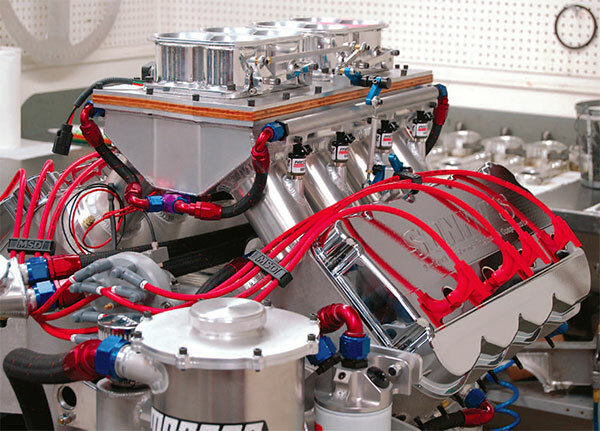 The single-plane manifold’s open plenum serves all eight cylin­ders at once and generally tends to promote even fuel mixture distribu­tion at higher engine speeds. That said, the specifics of various runner entries and runner lengths may pro­vide opportunity for selected runners to dominate others via pressure-wave exchange or cross-talk within the plenum, particularly on adjacent runners according to each cylin­der’s position in the firing order. A single-plane intake never achieves full resonance as found in dual-plane intakes. The lack of resonance limits low-speed torque, which can affect throttle response and drivability off slow corners, and also impacts fuel economy in the sense that it requires more engine speed and more throttle opening to produce effective torque. A large, undivided plenum exposes all eight cylinders to the car­buretor collectively, reducing booster signal and low-speed fuel metering consistency. 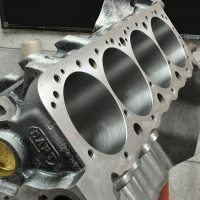 Larger plenum volumes tend to dampen the effects of cylin­der-to-cylinder pressure-pulse influ­ence, but open-plenum manifolds in general are sometimes subjected to fuel distribution issues caused by cer­tain cam and/or cylinder head con­flicts, or the undue influence of poor exhaust tuning. Single-plane intakes like this Dart spread-port unit for a 4500 Dominator expose all eight intake ports to a common plenum chamber. They generally provide more even fuel distribution and superior power from about 5,000 to 5,500 rpm on up. Taller versions and those with open spacers often gain power because they soften the exchange of pressure pulses between cylinders due to increased volume and an easier flow path. It is generally conceded that properly configured combinations typically provide more even fuel dis­tribution than most dual-planes par­ticularly at elevated engine speeds. The point is that you can’t assume this. There is power to be gained by investigating fuel distribution and mixture quality properties by what­ever means possible. 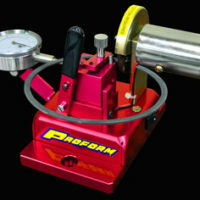 This is generally done on the dyno where precision instrumentation can lead the way, but you can gain some insight from plug readings, oxygen-sensor read­ings from side to side if you have them on the car, exhaust-gas tem­perature readings, and indications of reversion that may occur in indi­vidual intake runners or the plenum. Despite potential problems, single-plane intakes offer superior high-speed power. They incorporate shorter runners that tune to higher engine speeds while promoting high-flow potential and greater charge den­sity at high RPM. Single-planes can also be tuned with carburetor spacers. Open spacers are commonly used to increase plenum volume, which soften the impact of cylinder-to-cyl­inder pressure influences that affect air/fuel ratio consistency. Open spac­ers also ease the transition of the fuel charge from vertical, exiting the car­buretor throttle bores to near hori­zontal in the runners. Flow velocities through the carburetor can exceed 600 feet per second, which tends to slam fuel droplets against the ple­num floor, as an attempt to change direction into the runner. It has long been established that a mean flow velocity of 240 to 260 feet per second is optimal for best torque production. This depends on properly dimensioned ports and runners rela­tive to engine displacement. 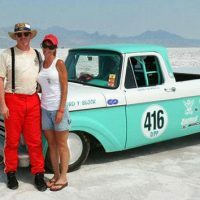 An air/ fuel mixture exiting the carburetor at 600 feet per second has to negotiate the relatively tight turn into the run­ners where velocity slows to the mean rather quickly. Air, being compressible, tends to make the turn and decelerate more easily than the incompressible fuel droplets that fall out of suspen­sion due to greater high-speed inertia accompanied by rapid direction and volume changes. This becomes the first post-carburetor opportunity to practice mixture conditioning. Highly atomized fuel produced by effective booster design changes direction more easily because smaller individual fuel droplets have less mass. Increased plenum depth and volume tend to support this cause. 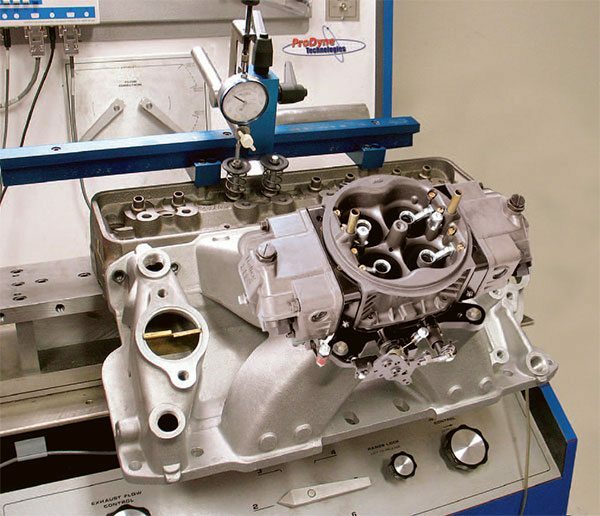 Engine dyno testing can help pin­point spacer configurations that improve single plane performance by addressing mixture quality issues. Since the problem only increases with engine speed and associated higher mixture demand, efforts to improve these conditions are often surprisingly worthwhile. Four-hole spacers and various hybrid or combination spacers are often used on single-plane intakes for similar reasons. In the long run, assist­ing mixture transition into the runner is usually more important than add­ing plenum volume to dampen ple­num pressure excursions. Generally, a spacer assists both of these concerns, and to some degree they can also be fine tuned through other means such as individual cylinder adjustments to valve and ignition timing. In the past plenum dividers were often added to single-plane intakes to boost carburetor signal strength. This was only partially successful as the uneven firing pulses acting on each side of the divided plenum did not permit second-degree freedom reso­nance. Instead, unpredictable reso­nant phases occur throughout the RPM range with inconsistent results that dramatically affect airflow and mixture quality. Carburetor spacers typically accomplish two things. First, increas­ing the plenum volume tends to soften inter-cylinder pressure distur­bances. Second, greater volume also reduces inlet airspeed and encourages the smooth transition of air and fuel into the individual runners with less fuel separation and puddling. Open spacers that provide a significant increase in volume sometimes allow a single-plane intake to modestly approach tunnel ram performance depending on the application. In some cases where a manifold sees more action near the lower end of its powerband, a four-hole spacer improves booster signal and often sharpens low-speed throttle response. With fixed dimensions, all manifolds generate their own particular sweet spot (RPM) where they deliver maxi­mum torque according to the dis­placement of the engine. Above and below this point they tend to fall in and out of tune according to dimen­sional influences on airflow and mix­ture quality that require evaluation and extensive tuning effort to opti­mize performance. As a rule, try to accomplish tun­ing cylinder by cylinder if you have the instrumentation to accomplish it. The physical layout and dimen­sions of any intake manifold rarely promote perfectly equal conditions in each cylinder, so individual tuning consideration becomes compulsory to the extraction of maximum per­formance from each cylinder. More often than not, it is highly beneficial. Tunnel ram manifolds are highly desirable for all-out racing applica­tions because they provide the very best configuration for equalizing runner lengths and volumes. They provide the most direct and unre­stricted flow path from the carbure­tor to the intake valve and they offer the best possible design for optimiz­ing flow velocity and mixture qual­ity. They are particularly effective at engine speeds above 7,000 rpm. If you don’t consider packaging issues, a long-runner tunnel ram can be an effective high-performance intake and a good choice for heavier drag cars needing a torque boost at lower engine speeds. Short-runner tunnel rams with appropriate ple­num volume provide superior high-speed performance, which is why you see them almost exclusively on professional drag racing cars (Pro/ Stock) and their high-RPM Sports­man counterparts. Tunnel rams present the best opportunity to optimize runner length, volume, and taper. You’re less likely to see variations in run­ner dimensions in these applications because they operate in a very narrow powerband that doesn’t require the pursuit of multiple torque boosts via selective intake and exhaust dimen­sional matchmaking. A heavier drag car might respond to manifold modi­fications to complement alternating exhaust dimensions to help broaden the torque curve, particularly if it operates over a greater RPM spread than a Pro/Stock car. 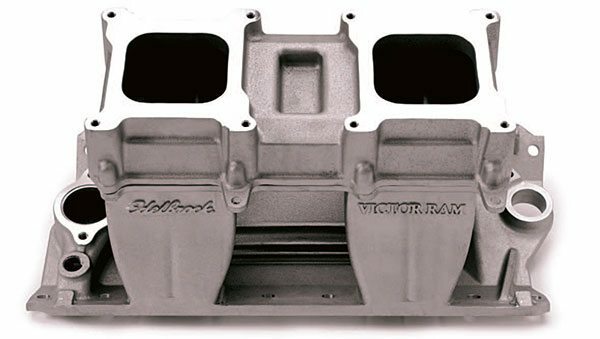 The two basic types of tunnel ram intakes include fixed-dimension aluminum castings made by major intake manufacturers and hand-made sheet-metal intakes built by specialty manifold companies such as Wilson Manifolds or Hogan’s Racing Manifolds. These intakes are custom built with very specific dimensions designed to closely match the engine’s final application. Run­ner length, shape, taper, and cross-sectional area are specifically matched to the engine’s requirements and the plenum shape, volume, and carbu­retor mounting surface are all sized to accommodate the exact require­ments of the engine. Taller, single-plane manifolds seek to emulate the superior flow paths of tunnel ram intakes. The raised carburetor location offers a straighter shot at the intake port on the cylinder head. This improves performance, but the fixed runner dimensions tune best to a specific engine speed and are not easily modified. 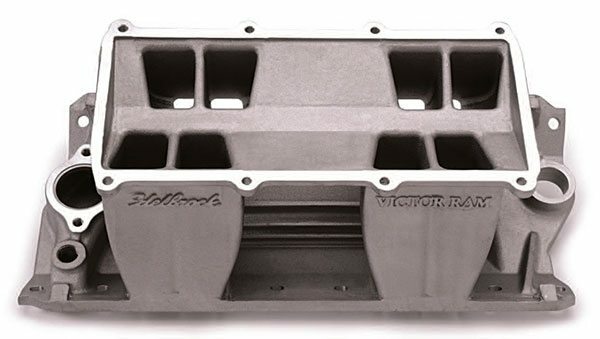 Basic tunnel-ram configuration like this Edelbrock Victor Ram incorporates specific tuned runner lengths, cross-sectional area, runner taper, and entry angles for superior performance with dual carburetors. Position the carburetors directly above the intake ports to ensure a direct path to the valves. Plenum volume is often altered by fabricating a dedicated top to suit the specific application requirements. Unlike more universal cast tunnel ram manifolds, sheet-metal intakes are very much engine and applica­tion specific. 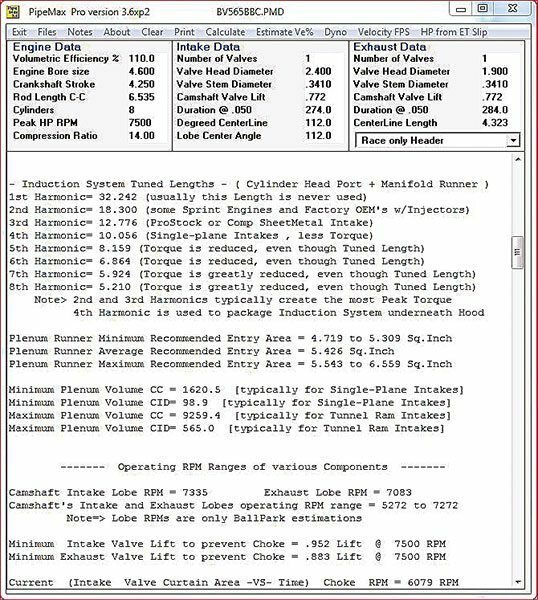 The hand-made appli­cation permits the engine builder to pinpoint very specific intake char­acteristics depending on how the engine will be used. These intakes are very labor intensive to construct and are thus quite expensive. Used ones are often available through eBay and other outlets, but the chances of finding one that matches your exact requirements are pretty slim and you could easily do more harm than good if you don’t thoroughly investi­gate the manifold’s exact dimensions prior to purchasing it. Most tunnel ram applications operate at extremely high engine speeds where it is important to accu­rately match plenum volume to dis­placement and the actual air demand in the engine’s most effective oper­ating range. The established rule of thumb dictates that optimum perfor­mance is derived from the smallest possible dimensions that adequately support the engine’s airflow require­ment. Runner cross section can position the torque peak relative to engine speed and vehicle require­ments. Runner lengths returning multiple pulse reflections generally tune best to the second reflected pulse (wave) if the engine requires a peaky narrow power band. Engines requiring a lower and slightly broader power band are better served by tun­ing runner length to the third or pos­sibly even fourth pulse. To calculate the optimum run­ner length based on reflected pulses, use the following formulas, which are taken from Motion Software’s Dynomation 5 engine simulation program. If you have correctly identified a power band depicted by the desired RPM spread between peak torque and peak power, you can use the McFar­land cross-sectional area formula (see page 96) to establish the optimum runner cross-section for your torque peak. Then use the reflected pulse formula (above) to pinpoint the sup­porting runner length. These efforts are more effective than you might suspect, particularly when combined with other known strategies to effect individual cylin­der optimization. When you tune each cylinder to its peak efficiency and take steps to boost torque across the required powerband it pays big dividends on the track. 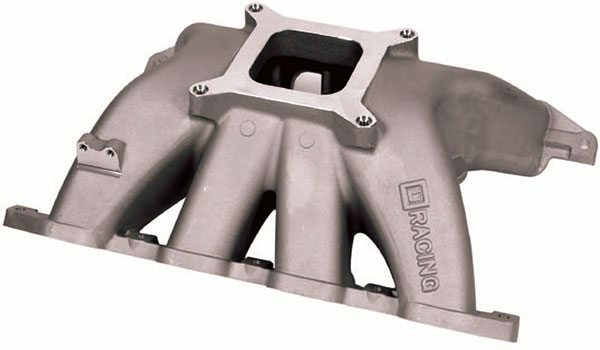 Accordingly, the intake manifold becomes one of the most influential components available for effectively tuning and positioning torque. A cursory examination of mani­fold styles notes particular differ­ences in plenum shapes and volume. Dual-plane intakes typically have the smallest plenums because the manifold is divided into two sepa­rate manifolds functioning almost independently of each other. As pre­viously noted, a major discrepancy of a dual-plane manifold is unequal plenum floor depth from one side to the other. This promotes uneven car­buretor booster signals from side to side and leads to uneven fuel distri­bution if not compensated by jetting adjustments. The upper-side plenum is more susceptible to high-speed fuel separation due to minimal distance between the carburetor throttle bore exit and the plenum floor. The low-side plenum is more effective at directing the mixture into the run­ner with less fuel separation due to reduced velocity and an easier path approaching the floor and the run­ner. The downside is reduced booster sensitivity on that side of the mani­fold and the attending potential for uneven fuel distribution. Also note that both plenum volumes are still smaller than that found in a single-plane manifold, and thus tend to provide superior throttle response at low to moderate engine speeds. Limited plenum vol­ume supports this even though both sides may generate slightly different fuel curves. Those who regularly calculate the results of various runner lengths and cross sections will appreciate the value of PipeMax, a handy PC software program from Meaux Rac¬ing Heads. The program calculates induction system tuned lengths and provides predicted results based on sound mathematical models. You can download it from the website for less than $50. If you accept that a fixed volume occupies the plenum at all times it’s easy to see that this volume main­tains a fixed amount of inertia or resistance to movement. One mol­ecule has to get out of the way before the next molecule can replace it. This requires a certain amount of energy, which is easier to generate with reduced volume. Thus the higher energy state of smaller plenums makes it easier to move the mixture and provides higher sensitivity (even if unequal) to the venturi boosters. Another important component of dual-plane intake operation is car­buretor size. For many years build­ers sought to minimize carburetor size to maintain good flow velocity. But the newer generation of highly efficient dual-planes fly in the face of convention. 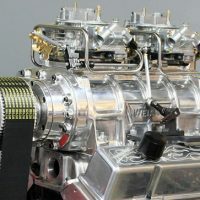 Traditional thinking suggests that because each cylinder connected to a given plenum sees only half of the carburetor’s total air capacity, the engine can effectively use a larger carburetor because the signal strength is greater. While there is some truth to this, the greater benefit of using a larger carburetor is more often found in more effective mixture conditioning. The larger carburetor reduces venturi airspeed, allowing the air/fuel mix­ture to make the turn into the run­ners more easily and with less fuel separation. Therefore, like spacers, carburetor size can be an effective tuning aid for dual-plane applica­tions when and if carburetor size is not restricted by the rules. Single-plane intakes are a differ­ent story. They may present more evenly matched signal requests to the carburetor boosters, but they are generally dampened due to increased plenum volume. This often requires more jet to compensate for weaker signal strength. When a spacer is added, volume increases, signal strength degrades further, and jet­ting must be readjusted to service fuel demand and establish adequate flow sensitivity at the jet. Spacers are a means of adding plenum volume to both single- and dual-plane intake manifolds. The primary purpose is to encourage mixture quality by easing the turn into the runners without detrimental fuel separation. There is a fine line between adjusting plenum volume for the promotion of mixture quality and the invisible dynamics of airflow inertia. Larger plenums as found in tunnel rams tend to soften inter-cylinder pressure excursions. Some engine builders feel that added vol­ume is also necessary to ensure ade­quate mixture quantity at elevated engine speeds. In reality, every com­bination has a select “sweet spot” that strikes an ideal balance between mixture quality, pulse tuning, and airflow inertia management within the plenum. While it is sometimes difficult to pinpoint exactly, calcu­lations to identify torque peak RPM and pulse-tuned runner lengths can put you not just in the ballpark, but well on the path to home plate. The best combination is not easy to determine, particularly on engines with a broad powerband. Still, it is possible to increase accuracy by con­ducting an airflow assessment of the manifold you intend to use, assum­ing of course that you are using a commercially available intake of fixed dimensions. Builders with flow bench access can flow test the manifold and cylin­der head together and it’s a good idea to include the carburetor with throt­tle plates locked open. This often requires some jury-rigged props and adjustments to set up on the flow bench, but it’s worth the effort. You then flow each runner and port com­bination separately with the other runners sealed off. This constitutes a basic airflow study that does not spe­cifically contemplate wet flow condi­tions or potential pressure influences from adjacent runners. It does establish a basic airflow map of the manifold and what each runner is capable of, independent of outside interference. It does not evaluate compensation for runner-to-runner pressure influence or the unsteady flow of dynamic valve operation, but it can illuminate air­flow weaknesses and inequalities that should be corrected or compensated for if possible. With the carburetor in place it also considers plenum volume, at least to the extent that it affects total airflow and the identifi­cation of problematic flow paths. Single-plane intake mani¬folds like this Dart Big Chief unit are particularly efficient single 4-barrel induction systems. Designed for spread-port cylinder heads, they encour¬age improved mixture quality by providing more efficient runner entry angles at the port interface. Some race intakes incorporate a sepa¬rate cooling manifold to direct water to each cylinder head for addi¬tional cooling, particularly around the area of the exhaust valve. 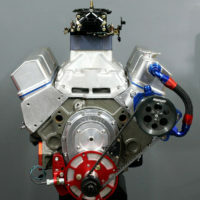 This example is a Chevrolet RO7 Sprint Cup manifold. For most race applications the valve opening action occurs so quickly that it isn’t generally neces­sary to evaluate low-lift flow except perhaps in the case of lower-perfor­mance circle track applications. It’s also not necessary to flow at all valve opening increments, but you should evaluate intake flow at about 65 per­cent of net anticipated valve lift. If the manifold/port combination sup­ports the calculated volume require­ments and runner performance is relatively equal at this point, it is probably sufficient at peak lift as well. Recall that the valve is only at peak lift for a fraction of a second, but it typically resides at or above the stated percentages for most of the valve event. These percentages repre­sent known values relative to piston position and port flow demand for optimum VE and efficient exhaust blow-down. Cylinder-to-cylinder flow varia­tions are often greatest with a dual-plane and least with a tunnel ram. In any case, careful flow mapping of the manifold in this manner helps to identify runners that may need indi­vidual tuning assistance in the form of rocker-ratio adjustments, individ­ual cylinder cam lobe profiles, header dimension compensation, and even timing and jetting adjustment based on runners that exhibit weaker or uneven flow characteristics relative to the others. Once you have created this flow map, you’ll be surprised at the follow-on thought process it provokes all based on a keener awareness of your equipment’s char­acteristics and recognized methods of compensation to increase and equalize torque. Fuel atomization is central to the practice of mixture condition­ing. This is particularly true for car­bureted applications that are limited to wet-flow fuel delivery methods. First and foremost, you want the finest or smallest possible fuel drop­lets in the airflow mixture. You also want the highest degree of homo­geneity (equality) of size among the smallest fuel droplets. For a given fuel volume, a higher percentage of smaller and evenly sized droplets presents more combustible surface area, which burns faster and more evenly. Droplets that vary in size slow the rate of combustion relative to smaller droplets because the larger ones are more difficult to burn. They also degrade mixture quality by fall­ing out of suspension easier when­ever they encounter abrupt changes in direction, cross-sectional area, runner volume, or mixture velocity. Issues of mixture quality are par­ticularly sensitive to booster design, plenum volume, runner configura­tion, surface texture, and flow path velocity. Any of these can lead to fuel separation and localized wetting of plenum and runner walls and floors. In severe cases fuel may actually pud­dle on the plenum floor, particularly on the upper plane of a dual-plane intake, making degraded mixture quality partially responsible for the diminishing efficiency of these man­ifolds at elevated engine speeds. Successful mixture condition­ing efforts incorporate all efforts to maintain the finest homogenous mixture while reducing dynamic influences that cause fuel separation. This includes fuel contact with run­ner walls, valves, cylinder walls, and piston tops, and the various surface textures they present. Excessive velocity can separate fuel, transitioning the bowl area below the valve. It can also fling fuel against the opposing side of the com­bustion chamber causing fuel wash that is compounded by rapidly rising piston motion and potentially inhos­pitable piston dome configuration. In considering this environment, consider every portion of the flow path from carburetor to combus­tion chamber. This includes carbure­tors, plenums, runners and runner entries, port shapes, valvestems, valve seats, combustion chambers, cylinder walls, and piston top con­figuration all potential sources of mixture degradation. Smooth or polished surfaces are particularly troublesome and should be eliminated from the flow path wherever possible. Dimpling and/or port surface striations perpendicu­lar to the flow path tend to support good mixture quality by reducing fuel separation. These depressions activate the boundary layer near plenum and runner floors by provid­ing a tumbling effect that tends to maintain flow velocity while keep­ing fuel droplets in suspension. In-cylinder mixture motion in the form of swirl and tumble as the mixture enters the cylinder also promotes mixture quality and cylinder filling. In practice, most high-speed com­petition engines favor some degree of swirl to help direct the burn toward the exhaust valve, but tumble has generally been found to have little effect at very high engine speeds. Suc­cessful efforts to encourage quench and active mixture motion typically permit a reduction in spark timing, which lessens negative work against the piston as it approaches TDC. Accordingly, equalization of EGTs, lower BSFC numbers, and an increase in torque typically accompany suc­cessful mixture conditioning efforts. Surface texturing is generally use­ful anywhere in the flow path, partic­ularly in areas that are prone to fuel separation due to directional changes or changes in charge velocity due to area variations. Manifold runners should never be polished and any place in the plenum that has been ground to match a spacer or modify a runner entry should be retextured. (This primarily applies to carbureted wet-flow applications.) Fuel droplets tend to stick to smooth surfaces so avoid them wherever possible. Depending on accessibility, ple­num and runner floors can be dim­pled with an appropriately blunt tool (1/8-inch rounded top) to promote rolling vortices or eddies that tend to return fuel into suspension and prevent further dropout. Dimpling is commonly used on piston tops and in combustion chambers that are easy to reach. Without prior engine operation there is no burn pattern to guide you relative to areas of fuel wash and incomplete combustion so you may want to reserve this tactic for after the engine has been run. 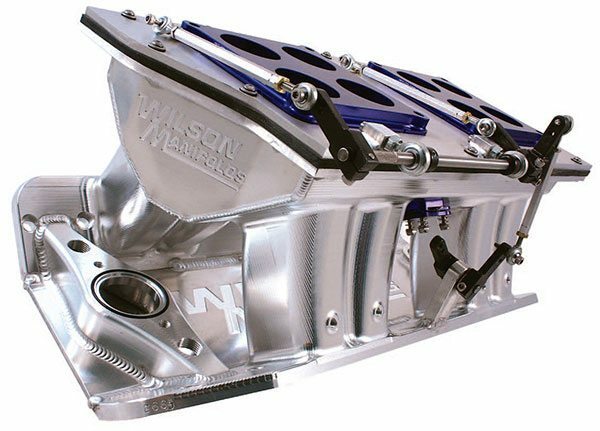 Part of the extensive work performed on intake manifolds at Wilson Mani¬folds includes proper surface textur¬ing to optimize flow while minimizing the potential for fuel separation in the runners. 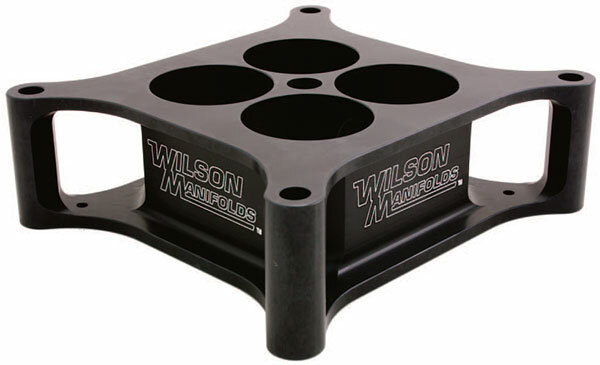 Wilson Manifold technicians modify and reshape the intake runners to accommodate the application in terms of runner entry angles, plenum-to-runner transitions, and other considerations to equalize each runner’s airflow and mixture quality contribution. Runner turn-ins are cut and reshaped to exactly match the cylinder head intake ports for optimum efficiency. The manifold-to-cylinder-head/run¬ner interface must maintain the cross section and taper to prevent fuel separation due to rapid area and velocity changes. An interesting example of dim­pling is found in the Tork-Link manifold offered by Hi-Tech Engine Components: a tall dual-plane intake specifically designed for some circle track applications. Hi-Tech also offers a Swirl-Quench piston design that incorporates dimples and a tapered ramp on the piston top to optimize homogeneity and direct mixture motion, and thus the burn toward the exhaust valve. Other applica­tions attempt to do the same thing by reading combustion patterns on previously run pistons and dimpling clean areas that exhibit little or no combustion residue. Some builders don’t fully sub­scribe to these concepts, preferring instead to glass bead piston tops, apply piston top coatings, and texture manifold passages as best they can. Some racers have also tried extrude-honing manifolds to increase runner volume, but this is generally a bad idea for carbureted intakes since it tends to polish the runners and there is no practical way to retexture them. Extrude honing is generally reserved for “dry flow” manifolds on EFI sys­tems where fuel separation is not an issue. At the very least, texturing manifold runners by glass beading improves mixture quality in mani­folds with very smooth runners. Reversion is present in all engines to some degree. It varies with engine speed and the particular combination of parts and timing events that encour­age it. Reversion occurs at intake valve opening when cylinder pressure is still greater than manifold pressure. This causes the remaining combus­tion residue to migrate into the intake manifold. This continues briefly until manifold pressure, cylinder pressure, and exhaust pressure equalize and a pressure drop is initiated in the cyl­inder. The incoming fuel charge then enters the cylinder contaminated with residual exhaust particles that previ­ously entered the manifold. Charge contamination reduces power by replacing useable fuel mix­ture with unburnable combustion residue a version of EGR that works to limit power production in all com­petition engines. This typically forces the need to de-tune the system with more timing advance and more jet to get enough fuel into the engine and burn it as efficiently as possible. More timing increases pre-TDC work against the piston (negative torque) and excessive fuel com­pounds the mixture quality issues that reduce power and increase fuel usage unnecessarily. Manifolds are more or less resis­tant to reversion depending on the application. Dual-plane intakes with smaller plenums and high-energy runners tend to dampen the effects of reversion. 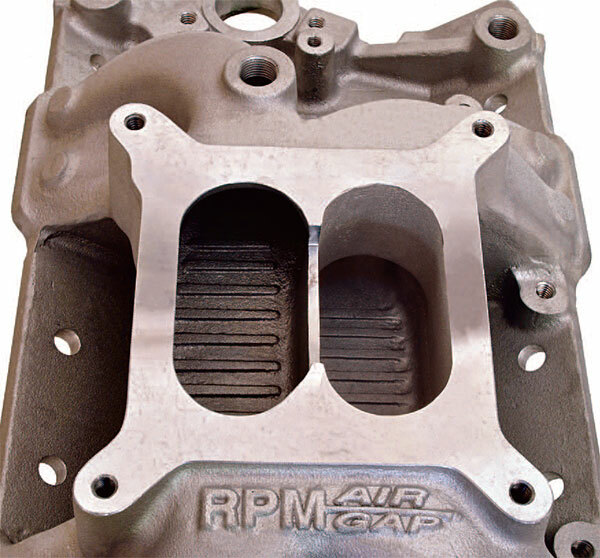 Single-plane intakes with large plenums and larger runners are more sensitive to reversion pressure and frequently permit a greater level of charge contamination depending on the intake valve closing point and exhaust back pressure during the camshaft overlap period. 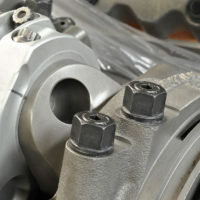 Efforts to reduce reversion include later closing intake valve timing to allow more time for cylin­der pressure to fall. Properly timed exhaust-valve opening helps evacu­ate the cylinder and draw in the next fuel charge without the pressure dif­ference that encourages reversion. To some degree carburetor spac­ers tend to encourage reversion by weakening manifold pressure. This can usually be corrected with prop­erly matched cam timing. Consult your cam supplier with the specifics of your package to deter­mine cam specs that resist the effects of reversion, particularly in the use­able power band of your engine. If you’re opting for a maximum effort, custom built intake make sure it incorporates all of the following considerations and any others that you may determine to be necessary. While the specific runner and ple­num dimensions, shape, and style of manifold hold the most potential for power production and power band positioning, there are additional fac­tors to consider depending on the exact requirements. 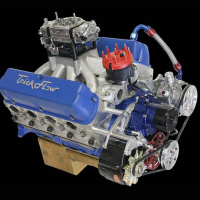 Very few universal racing engines deliver top performance outside their intended environment. 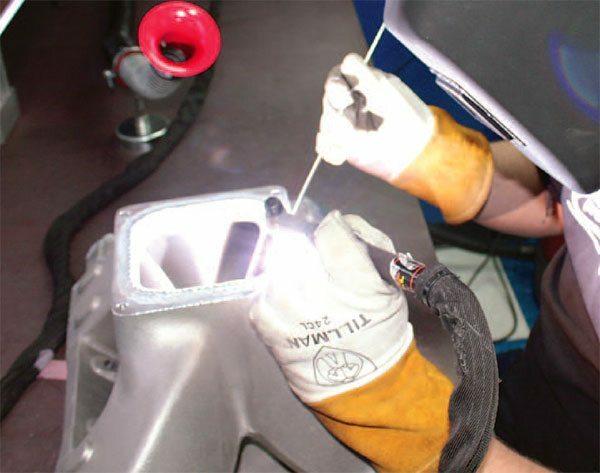 Once you have established the ideal mani­fold configuration and dimensions for your application, you may wish to apply additional techniques to help the manifold do its job at peak efficiency. Some of these modifications include heat management in the form of thermal coatings and/or types of insulation to isolate the plenum and runners from radiant engine heat. These coatings may be applied to the entire manifold or spe­cific areas such as the bottom, which is exposed to splash oiling from the lifter gallery. 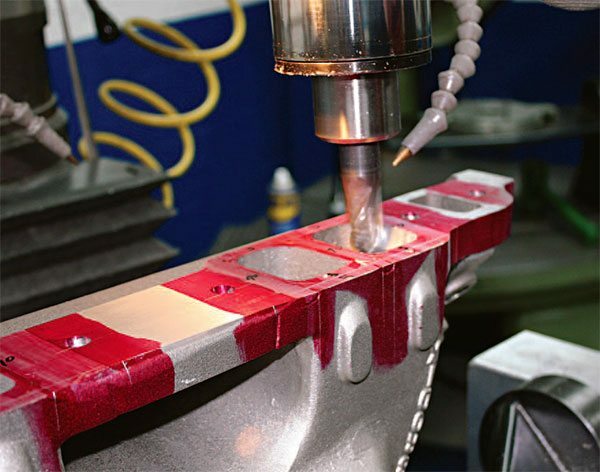 For marine applications, com­panies such as Dart Machinery offer specialized anti-corrosive coatings and marine jacket coatings to pre­vent saltwater corrosion in the water jackets of cylinder heads and intake manifolds, or a shielding treatment that resists galvanic corrosion in blocks and cylinder heads. You may also wish to incorporate modifications for “four-corner” or “center” cooling fittings to optimize coolant flow through the cylinder heads. Some manifold manufactur­ers specifically accommodate these needs. Others do not so you have to pick and choose from commercially available intakes or specify your exact requirements in a custom manifold. Even if you are only running car­buretors, it may be prudent to select or build a custom manifold that already incorporates bosses for nitrous oxide injectors or bungs for fuel injec­tors. This saves time and expense later if you decide to switch to port fuel injection or nitrous oxide injec­tion. Most good racing manifolds now incorporate dual-distributor hold-down clamp bosses so you can choose the most convenient loca­tion for locking down the distribu­tor. Many also incorporate threaded openings at the front and rear water jacket openings where bleeders can be installed to eliminate all air from the cooling system. While you may incorporate some form of carburetor spacer, depending on your final application, you should never choose to incorporate a carbu­retor adapter if you are seeking top performance. Most manufacturers offer adapters for 2-barrel carbs or to adapt 4150-style intakes to 4500 carbs or vise versa. While these com­ponents offer tremendous conve­nience and utility they almost never complement the ideal flow path and volumetric requirements that pro­mote optimum power, and more importantly, powerband positioning. If you are a top level engine builder you already know to avoid them. Shear plates (such as those offered by Wilson Manifolds) are an excep­tion. They are not really adapters but rather specifically designed airflow enhancement plates designed for tunnel ram intake manifolds. They integrate 1/2-inch-thick carburetor plates with 5-degree tapered throttle bore extensions with anti-reversion grooves that may be beneficial if you have made a poor camshaft selection. Although, if you need them, you have no doubt really missed your cam selection. Their primary benefit comes from the throttle-bore exten­sions that help maintain velocity and mixture quality via fuel shearing at the lower openings. Some build­ers really swear by them. Decide for yourself by observing what other winning combinations are running, but make sure your cam designer is onboard with it and definitely do the math to see how it will affect plenum volume and flow velocity. 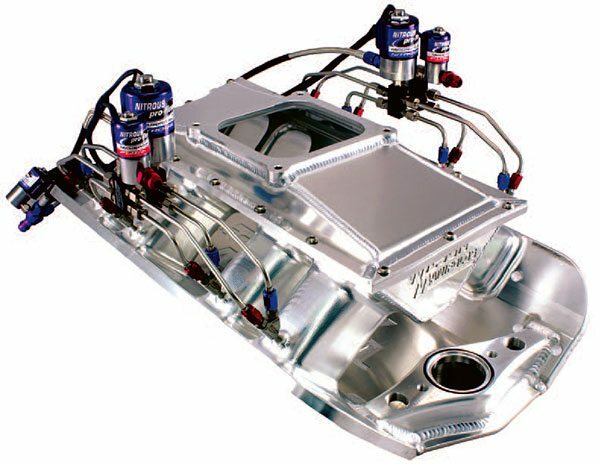 If light weight and top perfor­mance are your goals, a sheet-metal manifold is the best choice. 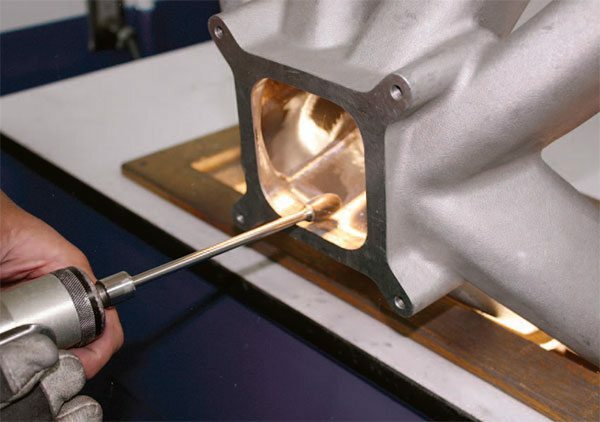 Flow testing your intake mani­fold with the carburetor(s) and cylin­der heads you intend to use can be very instructive even if not always scientifically precise. 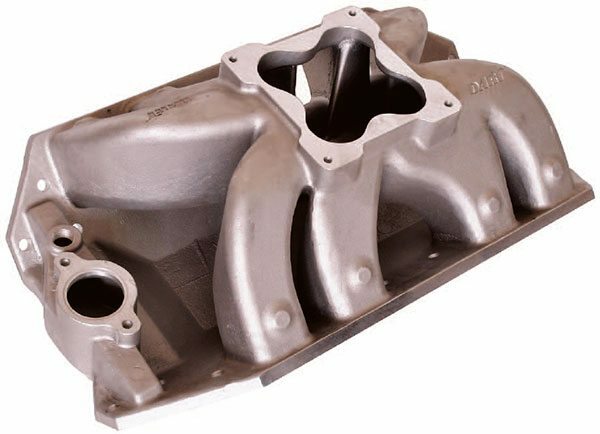 Most commer­cially available intake manifolds incorporate necessary compromises to accommodate manufacturing and production necessities. More often than not they meet broad marketing demands that require a more univer­sal approach with regard to applica­tion and fit. Custom sheet-metal intakes are a different story, but it is still a beneficial exercise to flow test the manifold and companion compo­nents together to investigate poten­tial anomalies and gather an overall snapshot of the airflow characteris­tics of the entire intake flow path. While this approach lacks the essen­tial dynamics of a running engine environment it identifies the overall capability of the components and exposes any major flow path defi­ciencies that may exist in one or more inlet paths. 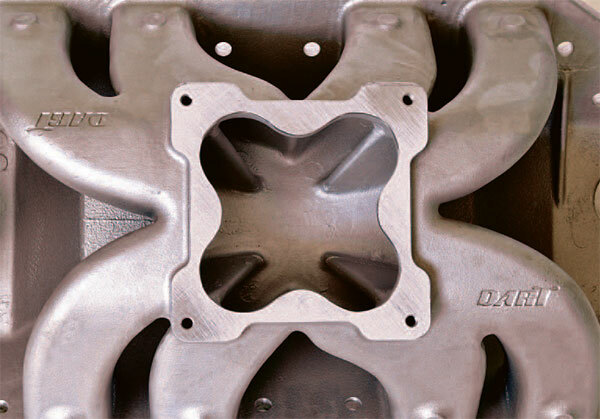 Most intake manifold castings reduce cylinder head airflow by 10 to 15 percent, which may give you cause to rethink your overall air­flow and cylinder head requirement for achieving optimum VE. 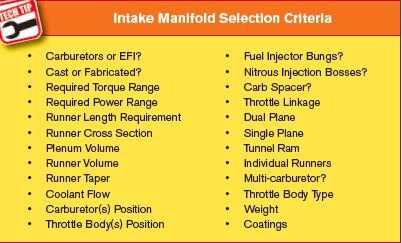 Proper intake manifold selection does not include choosing the best flowing head and then handicapping it with the most convenient manifold selec­tion. 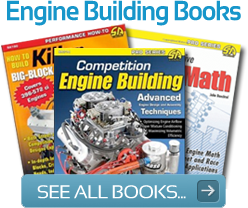 Complementary components and the attending mathematics are compulsory for top performance and you may find it worthwhile to return a poor performing manifold for a refund if it doesn’t pass the flow test with your high-dollar heads and carburetor(s). In many cases flow problems can be addressed and cor­rected with various modifications, but this may not be cost effective and a different manifold may provide a better solution. Flowing cylinder heads with the intake mani¬fold attached can illu¬minate manifold issues that might otherwise go unnoticed. For optimum results add the carburetor and flow with the throttle plates locked open. This helps evaluate the entire flow path for each cylinder in terms of airflow, but does not specifically contemplate mixture quality issues. Nitrous oxide systems do not typically complicate a well-built induction system. When the manifold is already correct for the application, a properly plumbed and tuned nitrous system delivers con¬sistent and equal cylinder-to-cylinder performance gains. 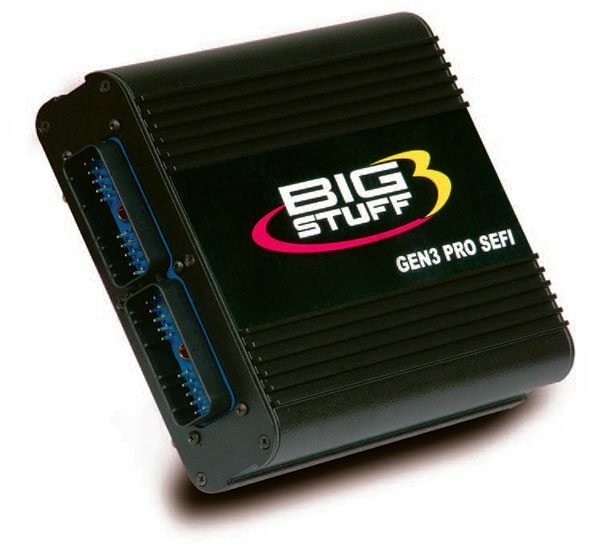 Big Stuff 3 EFI systems are found on some of the fastest Pro Mod cars because they provide excep¬tional control over all fuel and igni¬tion events, particularly when using nitrous oxide. In order to perform these tests successfully, you have to isolate and flow each runner in an identi­cal manner to determine the avail­able airflow potential absent outside influences that may affect individual runners via dynamic pressure wave influences in the actual environ­ment of engine operation. Recognize from the outset that this is an imper­fect evaluation designed in a sense to help determine which way is up. Still, you can learn from it if you con­sider the data thoughtfully. When mounting the manifold to the head, pay as much attention to port matching as you would when actually building the engine. Do the same for the carburetor(s) and make certain you are able to achieve WOT and lock it open. If your applica­tion is other than drag racing (oval track, road racing, or other), you may wish to also evaluate flow at sev­eral part-throttle openings such as 50 to 75 percent. All of this almost always requires some fancy rigging to support the whole thing while it is attached to the flow bench. Don’t despair. What you will learn is almost always worth the effort. Tape off every port that is not being flowed. You’re not going to see any pressure influences but you can observe how much air each individ­ual port and flow path is capable of flowing and identify any paths that are much better or much worse; then decide how they might be corrected. It is tedious work, and some builders are tempted to only spot-check a few ports, but you should check every­thing twice, three times, four times, or more as many times as it takes to make it perfect. No doubt the port you may pass over will turn out to be flow deficient. The engine will be down on power in that hole and you may never figure out why because everything else seems correct. The learning curve for EFI is still rather steep for many racers and engine builders, but it gets better and easier every day. Among the most consistent and easy-to-use systems are the F.A.S.T. systems and the Big Stuff 3 sequential units that permit very precise individual cylinder con­trol for both fuel and spark curves. F.A.S.T. electronic fuel injection provided the fueling con¬sistency to propel this 369-ci Mike LeFevers-built turbo¬charged small-block Pontiac Firebird to a 300-mph record at Bonneville with Joe Kugel at the wheel. 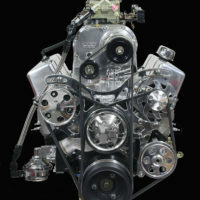 EFI systems replace the carburetor with a billet throttle-body assembly of the appropriate size for the appli¬cation. Since fuel is added via the electronic injectors the throttle body only flows air. F.A.S.T. 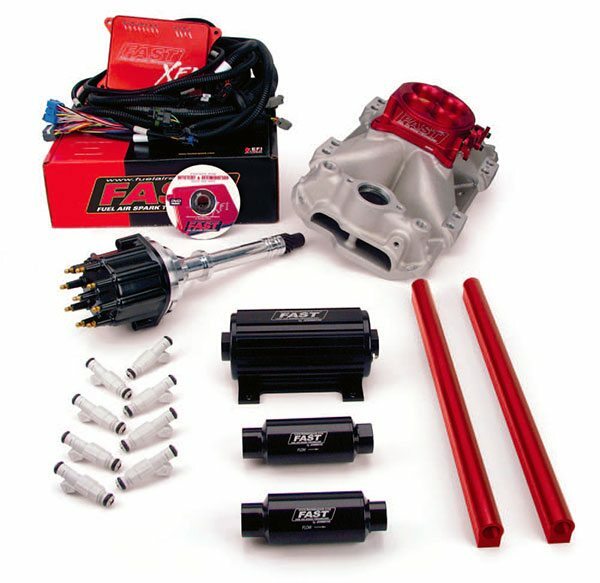 XFI fuel-injection kit provides all the necessary components to incorporate a race-ready EFI system. This system would be ideal for a fast drag-race bracket car seeking maxi¬mum consistency. Engine building per se does not require many changes to incorpo­rate EFI, but you may want to study the available systems to decide what best suits the requirements of your application.